Delicacy Caramel Wheat is made from green wheat malt by roasting. 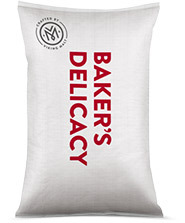 A high degree of caramelization is characteristic of this malt. The amylolytic activity of Caramel Wheat is zero. Caramel Wheat has sweet, malty, bready, dark toast flavor. Caramel Wheat is well suited for color adjustment and flavor enrichment for bakery as well as other food products. Caramel Wheat has sweet, malty, bready, dark toast flavor.